Leading Manufacturer of crazy cruise slide and water slide crasy cruse from Mumbai. We are offering Crazy Cruise Water Slide to our client. 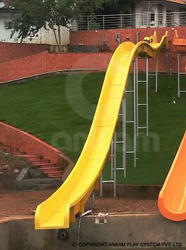 We are the leading manufacturer of Water Slide. This slide can be used by Clubs, Water Parks, Resorts, Farm etc. These Slides are available in different colors and sizes. These Slides provide unlimited fun for all ages. We manufacture the wide range of Water Slides like Body Slide, Family Slide, Float Slide, High Thrill Water Slide, Swimming Pool, Kids Activity Slides etc. This slide is available in attractive colors. We are offering Crazy Cruise Water Slide to our client. We are the leading manufacturer of Water Slide. This slide can be used by Clubs, Water Parks, Resorts, Farm etc. These Slides are available in different colors and sizes. These Slides provide unlimited fun for all ages. This slide is available in attractive colors. Looking for Crazy Cruse Slide ?